You know that people can do cool things with datasets and overlays for Google Maps. 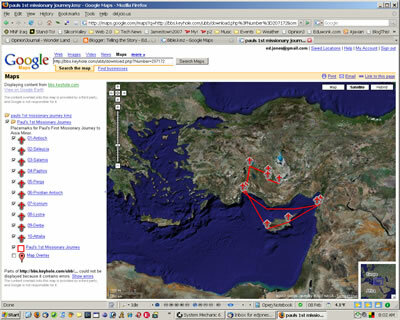 This one locates sixty sites from the Bible on a satellite map of the land. Bible.kmz - Google Maps It's a strange collection; not as familiar a set as might be. Still, who can resist the beauty of zooming in on Solomon's Porch? Paul's 1st Missionary Journey offers a different view-one extended event mapped out. This one hits me especially deeply: such a map sketched out in Paint was one of my very first efforts to bring History to the net.